Stonewashed forest green cotton with adjustable buckle closure. 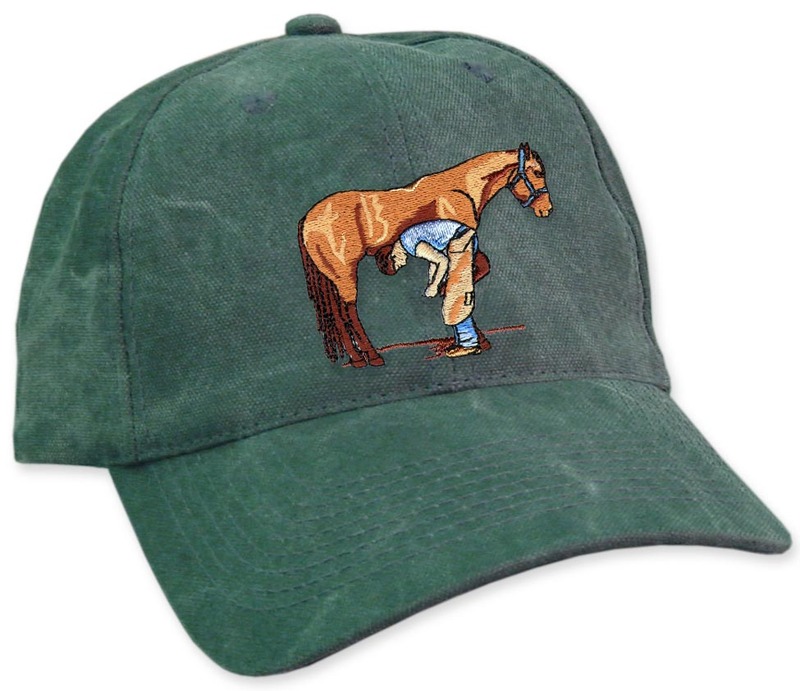 More about our Farriers Caps; unique, high quality hats - that are NOT free! Each time we attend a farrier function, we witness this frantic dash to visit all the booths, and reap all the benefits of "freebies" that events of this type offer. Many manufacturers give away all sorts of nifty products, emblazoned with their logo, to consumers of their products. Ball caps are always a favorite, and most farriers have quite a collection of different specimens. It makes it a little tough for us to SELL ours - when other vendors are giving away a similar product. However, when I look at the huge stash of hats that my husband has - the ones tucked away in the closets, and drawers vs. the ones he actually wears... Certain caps come out on top every time. As a picky cap consumer, he has specific features that he loves, and hates about his hats. A detail that seems minor to me - that doesn't measure up to his standards - can relegate that cap to the back of the drawer - forever. Our caps are of sturdy, neat construction, made of fabric that is durable and tightly woven - holds it's shape without being too stiff. The fit is sensible - not too low, but not too tall either (who wants to look like Elmer Fudd?) And the buckle closure on the back is the clamp style - allows infinite adjustment options for a perfect fit. So, for under $20.00, you can buy a cap from us that surpasses his standards - that you can wear comfortably every day. Why be someone's walking billboard? When you can display a tasteful farrier logo that also coordinates with our other farrier business cards, invoices, and golf shirts.